Geekwire recently shared a note that Seattle-based PopCap Games wrote to its new owner Electronic Arts. If you’re not familiar with the company, it might be…confusing? 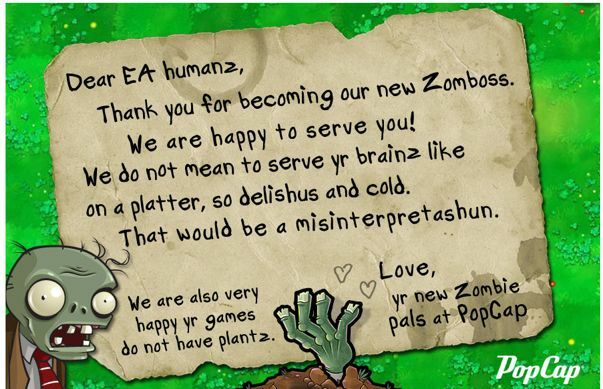 PopCap makes the popular game Plants vs. Zombies, and in this note the company spokespersons are the zombies that march relentlessly through your yard, attempting to eat your brains. PopCap’s doing an interesting thing here from a copywriting perspective: it is presenting an alternate, fictional world in which the characters in its games are PopCap employees. 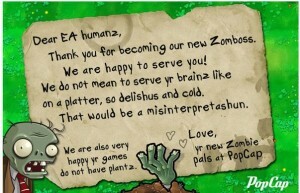 The zombies are aware of the company’s acquisition, and when they got the news they felt that a friendly note to their new “Zomboss” was in order. A frequent problem game companies face is that their audiences shower their games with love but don’t care much about the company. This is natural: games have engaging characters, catchy music, and worlds that you want to visit again and again. They are designed to beat the pleasure centers of the brain repeatedly with a Wiffle Ball bat. They exist to be loved. One way to transfer some of that love from the game brand to the company brand is to overlap the game and real worlds, as PopCap does in this example. People who play games would love to believe that your offices are wondrous places where amazing things happen all the time. Social media in particular is a good place to bring that idea to life, and make your company news more entertaining by building a consistent brand fiction that incorporates your game fictions. Maybe your headquarters is in Culver City; but maybe you also have an office that’s in orbit around Saturn, with the attendant problems in sharing people and resources. Perhaps the ferocious little critters that eat everything in sight in your new game have run amuck, and your employees are frantically sealing the exits and rounding them up. This works best if done sparingly: overdoing the fiction can backfire, and create a gulf of unbelief between you and your audience. It also works best with humorous characters such as PopCap’s zombies. If your game is full of tragically beautiful people mourning the loss of their homeworld, you’ll want to think hard about how you’ll treat them if you incorporate them into your company’s alternate-world mythology. With the right characters and the right tone, used appropriately, this type of brand world-building can liven up your news and inspire new types of content across your channels.